After more than 42 months of planning, Saint Francis Medical Center opened its new five-story patient tower on July 1. Saint Francis broke ground on the $127 million expansion and renovation project, “Building on Excellence,” (BOE) on November 28, 2012. The project adds more than 234,000 square feet of new construction and 148,600 square feet of renovated space, as well as an underground parking garage, to the current footprint, bringing the Medical Center to more than 1 million square feet. The second, third and fourth floors of the tower feature all private patient rooms with dedicated areas for orthopedics, neurosciences, medical and surgical patients. Each of the specially designed rooms has a lift system for patient and caregiver safety and flat thresholds throughout so patients are less likely to trip on the floor. The Pain Management Center and Wound Healing and Hyperbaric Center are easily accessible on the first floor. The fifth floor is reserved for future expansion. Also in the tower lobby is The Friends Café by My Daddy’s Cheesecake, featuring food and dessert items from the popular local restaurant, creating a central location for patients’ families, visitors and friends to gather for a snack or in respite from the patient care environment. The Friends Café will be operated by My Daddy’s Cheesecake employees and will be open 7 am-7 pm Monday through Friday and 8 am-3 pm Saturday and Sunday. The Friends of Saint Francis raised $85,000 in support of The Friends Café by My Daddy’s Cheesecake. Outside the Café is the expanded healing garden, which features a variety of surfaces and elevations, to be used by rehabilitation patients as they prepare for home, as well as a peaceful and relaxing space for visitors and families. The Saint Francis Auxiliary funded the garden. The Saint Francis Auxiliary and The Friends of Saint Francis also sponsored the large water feature and restoration of the historic statue of St. Francis of Assisi at the main entrance. 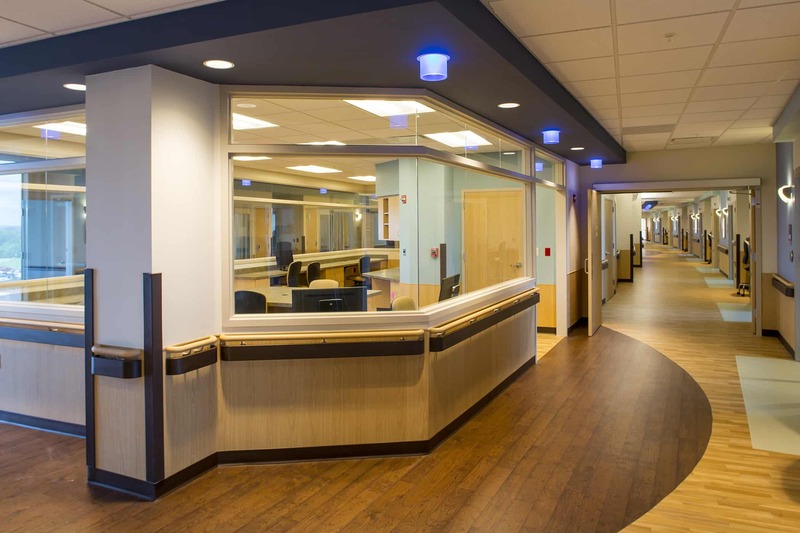 The project also includes the creation of a Women and Children’s Pavilion, which houses the Family BirthPlace and the Level III Neonatal Intensive Care Unit (NICU). When the entire project is complete in 2016, Cape Care for Women also will move into the space. Over its timeline, the project has created work opportunities for more than 400 construction workers and countless vendors and subcontractors – 95 percent of which are local, from Saint Francis’ service area. It also will add about 50 jobs to the Medical Center’s workforce.